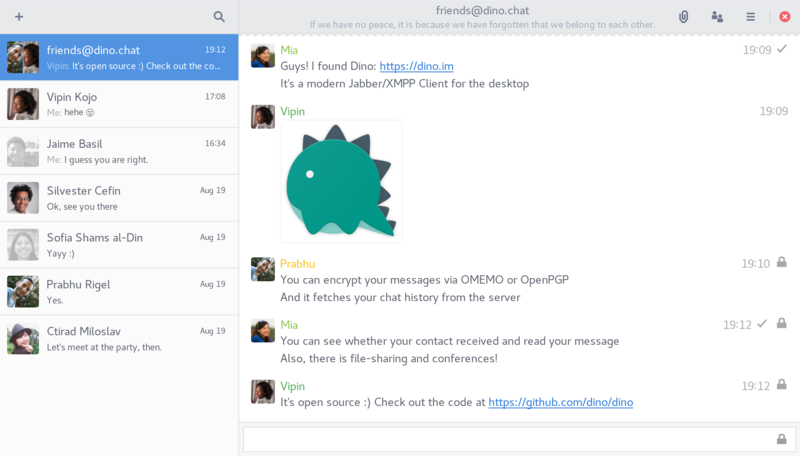 Dino is secure by default: Your chats never leave your computer unencrypted. Once you enabled end-to-end encryption via OMEMO or OpenPGP, only you and your chat partners can read your messages, but not your server administrator or anyone else. If you want to increase your privacy, Dino allows you to disable read and typing notifications – globally or only for specific contacts. Free Software. Check out the source code. Being free and open-source software, anyone can inspect and modify Dino. This means that you don't have to trust a single company or development team. Dino is developed on GitHub by an open community where everyone can contribute – by creating a bug report, translating Dino into their language or making a pull request. Decentralization. Powered by the people. 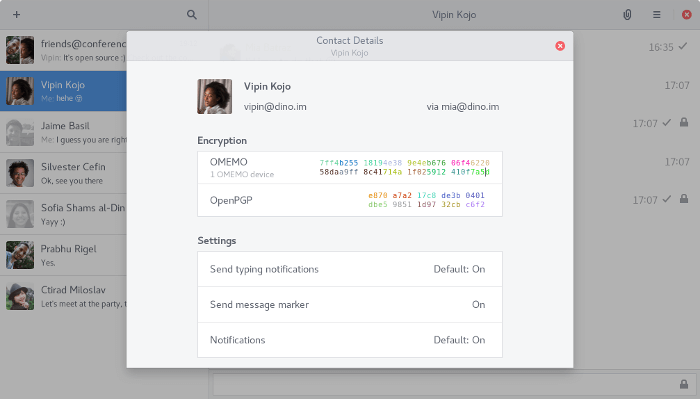 Dino is build on the XMPP protocol, an internet standard for decentralized communication – the instant messaging pendant to email. Decentralization means you don't have to rely on a single provider or company, instead you can use a federated world-wide infrastructure. You can even host your own server! You can get Dino from the repositories of many Linux distributions. For up-to-date versions you can use Dino provided by our OBS repositories. Check out the "Distribution Packages" wiki page for more information. 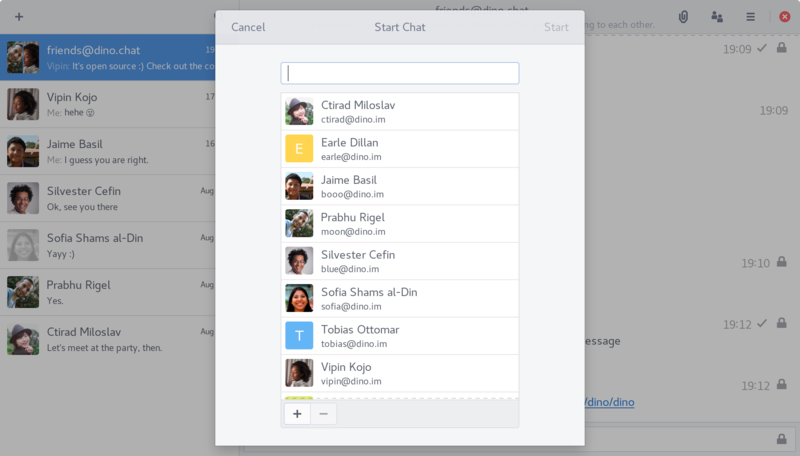 XMPP is an open standard for communication, mainly used for instant messaging. It is a secure battle-tested protocol developed by an independent standards organization. The "X" in XMPP stands for "Extensible", which means the core protocol is updated and extended with more features through a transparent process at the non-profit XMPP Standards Foundation every now and then. This results in some clients not implementing every feature of XMPP; for example, a typical instant messaging client won't implement Internet-of-Things functionality. Dino supports the most important standard extensions (XEP) for a modern chat client*. You can see an excerpt of the list of supported XEPs on the right. * It is compliant with the official XMPP Compliance Suites 2016. Join our XMPP chat room at chat@dino.im to share ideas or ask questions. If you notice any problems or miss a feature, please report it on our issues page. Help translating Dino into your language on Weblate. We invite interested developers to contribute code. Check out our repository on GitHub. Support the developers on Liberapay or via PayPal using address paypal at dino.im. You can contact the developers at contact at dino.im for professional enquiries.